Banks will eventually be valued on their dividend paying ability. 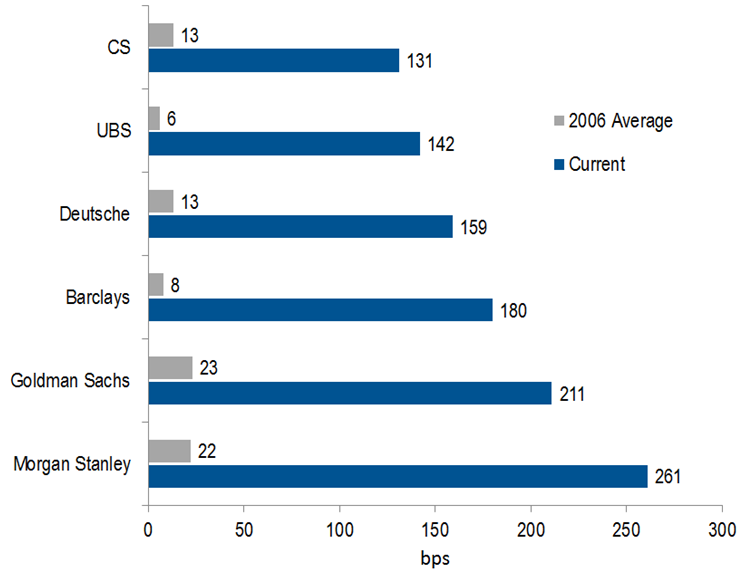 Leverage ratios and dividends will become the key metrics for valuing bank stocks. Leverage should now be the starting point for assessing banks as it is a better indicator of potential bank failure than capital ratios. Return on assets will be more powerful than return on equity as a driver of price to tangible book value. Investors will award a premium to banks with sustainable dividend yields. Investing in banks has been a precarious pastime; witness the rollercoaster which has been the Euro Stoxx banks index over the past two decades. Having more than doubled in the late 1990s, the index halved in the early 2000s, only to go up three-fold by June 2007 since when, it has fallen 80% and is now back at 1990s levels. 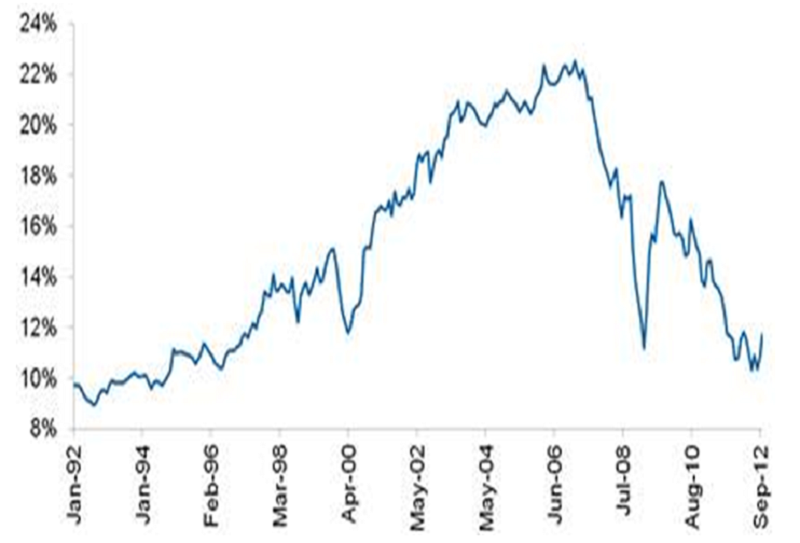 At their peak, in March 2007, bank stocks were valued as highly as 3.5x book value, yielded 6-8% and comprised more than 20% of the European market. The fall from grace has been dramatic; banks now trade below tangible book value and pay negligible cash dividends and even after the recent bounce in a number of European bank stocks the weighting of the sector in the Euro Stoxx 600 index is a mere 11%. Accounting and regulatory changes have made banks even more pro-cyclical. Through a range of rules and perverse incentives, banks have been allowed to take gains on the upside but not necessarily recognise losses on the downside. 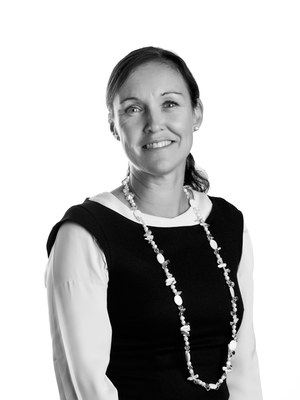 They have been allowed – and duly complied – to transfer assets from ‘available for sale’, where assets are valued at market prices, to ‘hold to maturity’, where they are valued at original cost. This flexibility has led to big bonuses being paid on inflated earnings and dividends being paid out of shrinking equity bases. 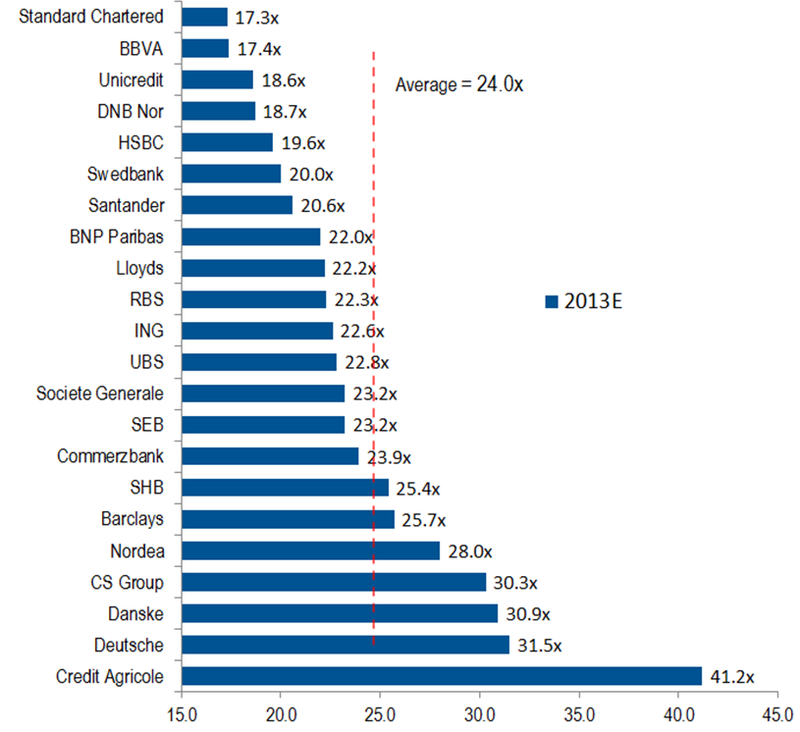 One of the stark features of the European bank sector over the past decade has been the huge increase in leverage; investment banks have almost doubled leverage ratios whilst commercial banks are now more than 20x leveraged. the ratio of deposits/debt fell from 1.4 to 1.2 and loans/deposit grew from 93% to 104% in 2007. This has made banks very reliant on wholesale markets for funding and credit ratings, which influences their cost of funding. 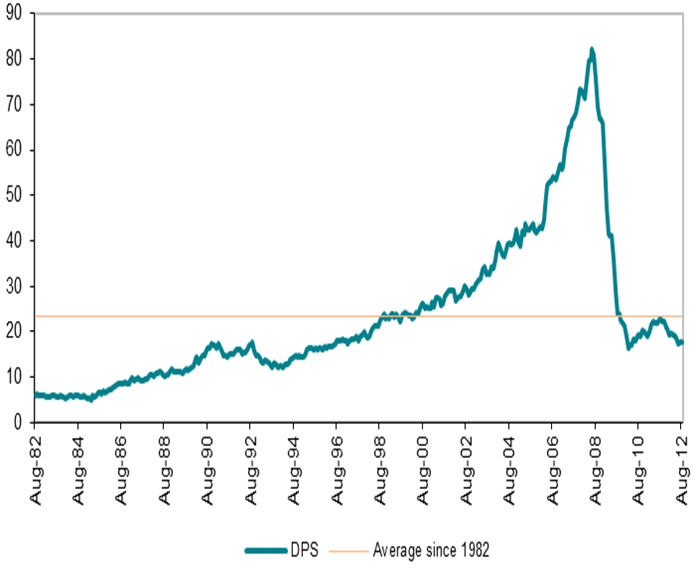 In the past, received wisdom was that higher leverage led to higher returns, but in recent times the stock market has consistently looked through leverage with banks suffering a significant de-rating of price/book (P/B) valuations, an even bigger de-rating than that seen in the Great Depression. We believe a good starting point for bank valuation is leverage ratios, measured simply by equity/assets. Banks fail primarily due to liquidity – when bond markets no longer want to finance a business model. This was the common theme running through Lehman Brothers, Washington Mutual, Dexia and Northern Rock, despite very different business models. A common factor was high leverage – a small equity base relative to the size of the asset pool meant not much could go wrong before losses were incurred. 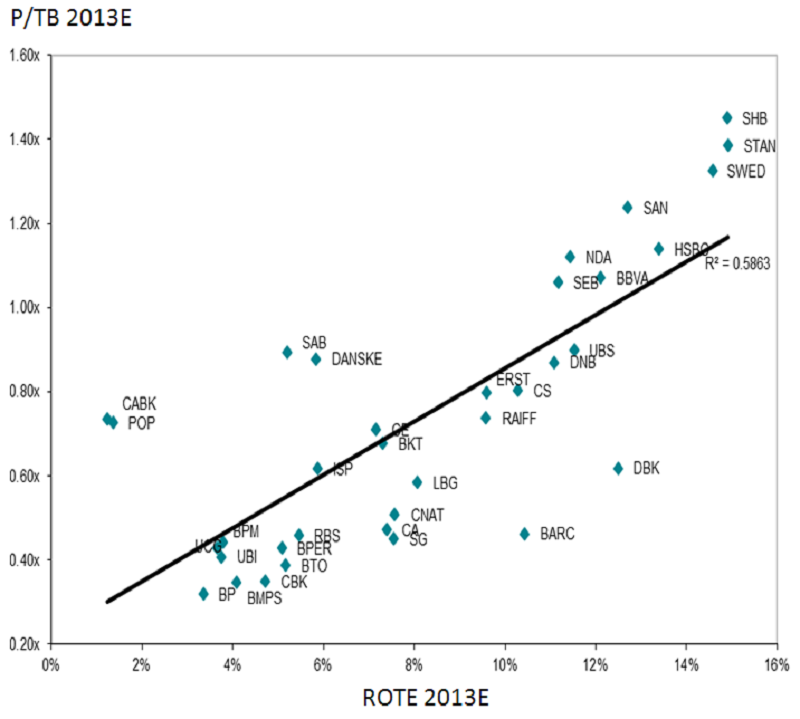 In conjunction with leverage ratios, it is also important to look at how much of a bank’s returns are achieved from the return on its assets (ROA), which cannot be exaggerated by leveraging the balance sheet. 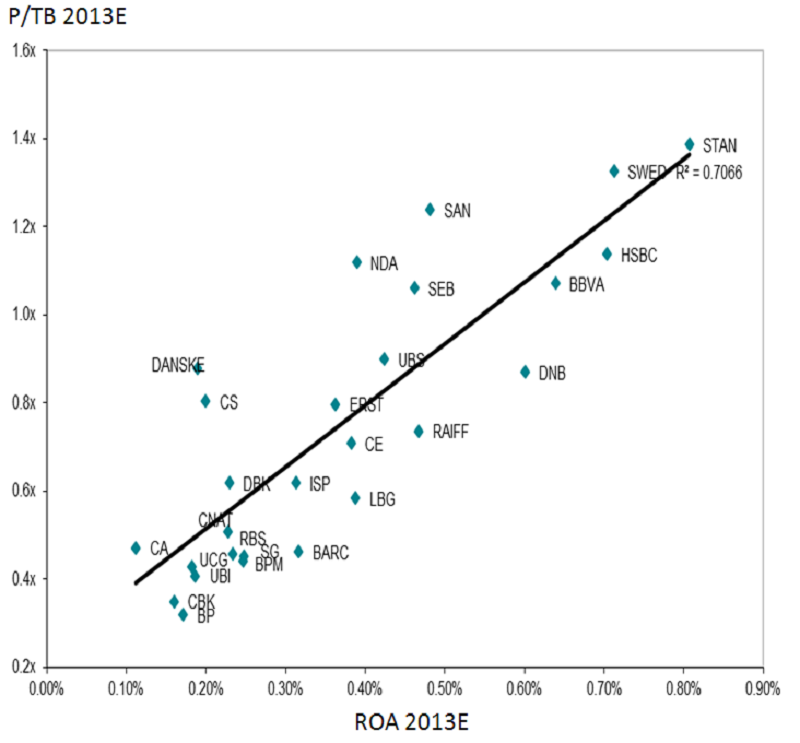 The charts below show there is a far stronger correlation between ROA and price/tangible book (P/TB) valuation than there is with ROE and P/TB. The market does not reward high returns based on leverage! European regulators have opted for 3% as the minimum leverage ratio (or 33x assets/equity). This means a bank can lose or write off 3% of its assets before exhausting shareholders’ equity. But, for the largest banks the leverage ratio would have needed to be 7% to guard against failure in the recent crisis. This inadequate leverage ratio means the market will continue to superimpose its own metric in accordance with what it deems appropriate. Sheila Bair, former chair of the US Federal Deposit Insurance Corporation, believes banks should be levered only 15x. “During the height of the financial crisis, all of the investment banks that were troubled had leverage ratios below 4%. They relied a lot on short-term market funding and foreign deposits, all of which were highly susceptible to runs.”4 We share her view that insured deposits and long-term debt are more stable, and this is why it’s important to stress liquidity as well as capital to make sure financial institutions can survive a highly stressed environment. Dividends are a thorny issue for banks at present. 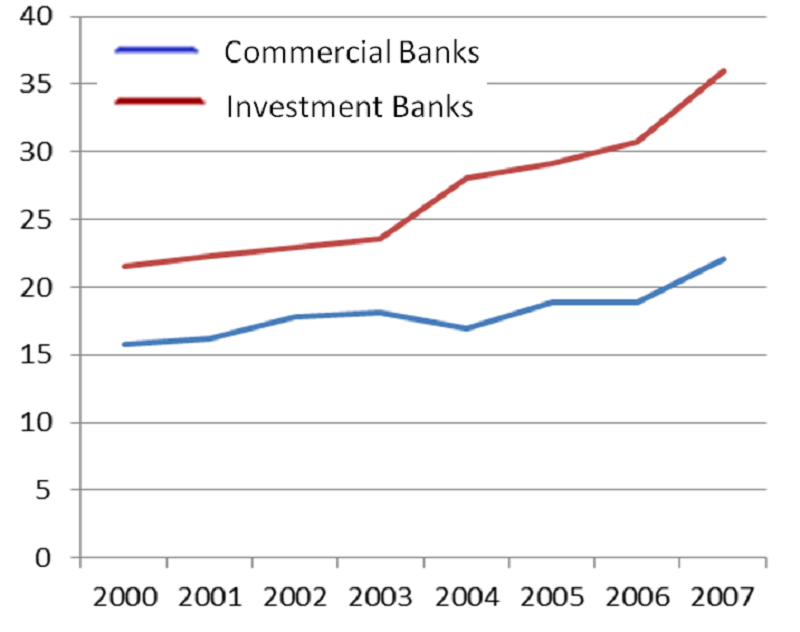 Hearty payouts, which increased from 0.4% of assets in 2000 to 1.1% in 2007, were one reason banks featured heavily in most portfolios in this period. Even through the first three quarters of 2008 – in the eye of the sub-prime storm – the payout remained at 0.7% of assets. But, following the sub-prime and European sovereign debt crises, few European banks now pay cash dividends and more than half either offer a token payout or none at all. Some economists suggest that investors should be indifferent to whether a company pays out cash or reinvests it internally, others have argued that paying dividends is a transfer to equity holders and violates the priority banks have to debt holders. An unsustainable dividend payout may result in higher funding costs as bond holders want a bigger equity cushion. Banks may then become more reluctant to lend in order to preserve capital ratios. In the new Basel 3 “hands-on” regulatory world, most national regulators have taken a far tougher stance on dividends, linking dividend payouts directly to the capital strength of banks. In the US, several banks, in particular those that received state aid have been reprimanded or prevented from paying out dividends. Banks will eventually be valued on their ability to pay a dividend as this becomes the real form of measuring cash flow and sustainability of capital ratios. We would award a considerable valuation premium to those with a sustainable dividend policy. 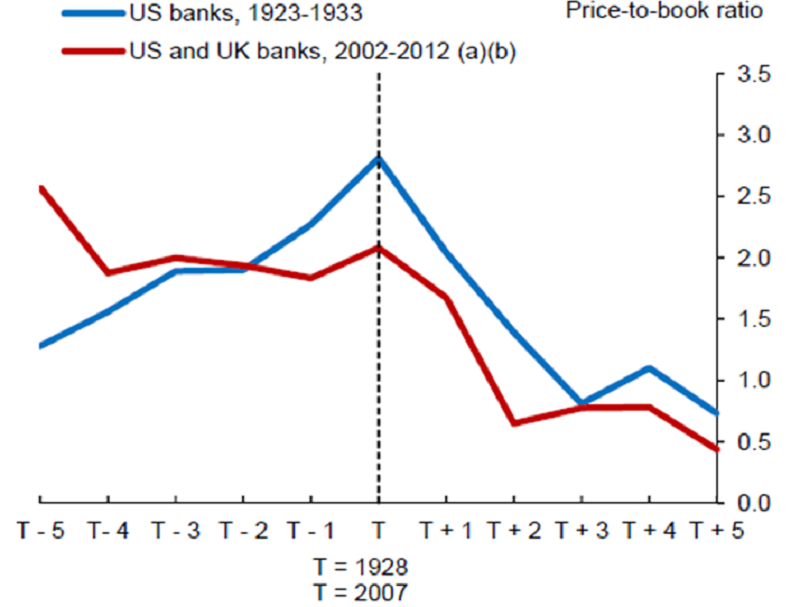 Relative to history, the bank sector is trading at the low end of its valuation range. Its leverage ratio, however, remains higher than the historical average and many years of deleveraging lie ahead. One positive of heightened regulation and low valuations is that banks will be forced to change, if not by regulators, then by debt investors. Business models where returns are sustainably below cost of equity will have to restructure or be closed down, as funding markets will not fund these businesses indefinitely. Whilst it is almost impossible for regulators to force banks to close specific businesses such as investment banking, Haldane aptly observes: “This conjunction (the large discount to book valuations) is stirring market pressures to separate. Bankers today, many cursed and condemned, could make a virtue of necessity. The market could lead where regulators have feared to tread.” This break up or change in business model may well be the valuation catalyst that equity investors are waiting for. Andrew Haldane, Member of the Bank of England Monetary Policy Committee, ‘The dog and the frisbee’, speech at Jackson Hole Wyoming on 31 August 2012. Viral Acharya, Irindi Gujral, Hyun Song Shin, ‘Dividends and Bank Capital in the Financial Crisis of 2007-2009’. Haldane, ‘The dog and the frisbee’.